Private Browsing is an optional Safari browsing mode that causes no data from the browsing session to be saved, this means no cache files, cookies, or browsing history will be stored or collected in iOS, making for a fairly anonymous session on the client side. Using Safari Private Browsing is a popular browsing choice for a wide variety of reasons, and it’s now easier to use on every iPhone, iPad, and iPod touch, because you can now toggle the setting on directly in Safari, and without losing all existing Safari browser pages. This offers considerable improvements over what existed previously, but like much of iOS post the major overhaul, it can be confusing to find until it has been pointed out to you. 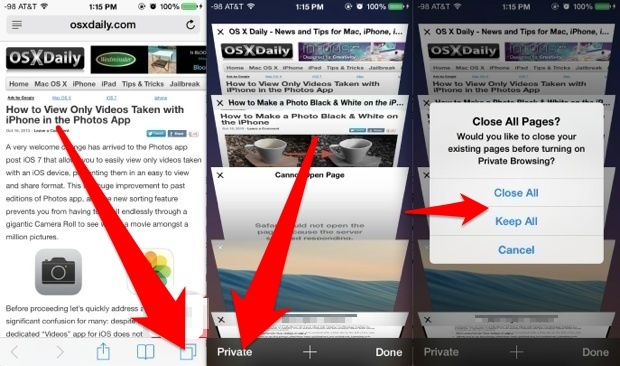 Using the Private Browsing option in Safari with iOS 11, iOS 10, iOS 9, iOS 7, and iOS 8 (or newer) is very easy, and the feature works the same on the iPhone, iPad, and iPod touch. This tutorial will demonstrate how to use this great feature. The “Keep All” setting is ideal for most users if you don’t want to lose your prior windows, and if you’re using Private Browsing on someone elses devices to log into an online web service or account it’s probably the most considerate option. The “Close All” option is usually more useful upon exiting Private mode. Private Browsing is very easy to identify when it’s enabled because the browser window elements turn into a dark grey, both on an individual webpage screen, and on the browser tab panel view. Keep in mind that entering and exiting out of Private mode will not cause you to lose previously stored cache, history, or cookies, and clearing Safari’s browser data out must be done separately through the Safari Settings options, which also offers an optional site-specific removal setting to delete data for individual websites and domains. Exiting out of private browsing can be done at any time, repeat the same steps as above but this time tap on the “Private” option again unselect it. You will still have the option to either close all or keep all existing web pages, either of which will switch out of private and back to normal browsing mode. Users who have prior versions of iOS installed on their iPad or iPhone will find the option exclusively stored in the Settings. It’s not like that in iOS 7.0.3. On iPad. Click on the URL, and the keyboard appears. Hide the keyboard, and you will see “Private” at the lower left corner of your screen. Click it to get the options list,, and click on the option you want. Click again on “Private” to turn it off. Thanks Alan, i managed to go back to white top! Thank you so much!!! Been trying to figure this out for weeks!!! Your instructions appear to be invalid for iOS 9 on iPad. These instructions are for all iPhone, iPad, and iPod touch. As long as it is running iOS 10, iOS 9, iOS 8, or iOS 7, you will find Private Browsing Mode works exactly as described above. Easy. Actually, that’s not how iOS 9+ works at all. I skipped iOS 8, so I know your description of iOS 7 is accurate. On iOS 9, the “private” button no longer shows on the keyboard or the freshly opened page that shows your bookmarks before you actually go to a website. 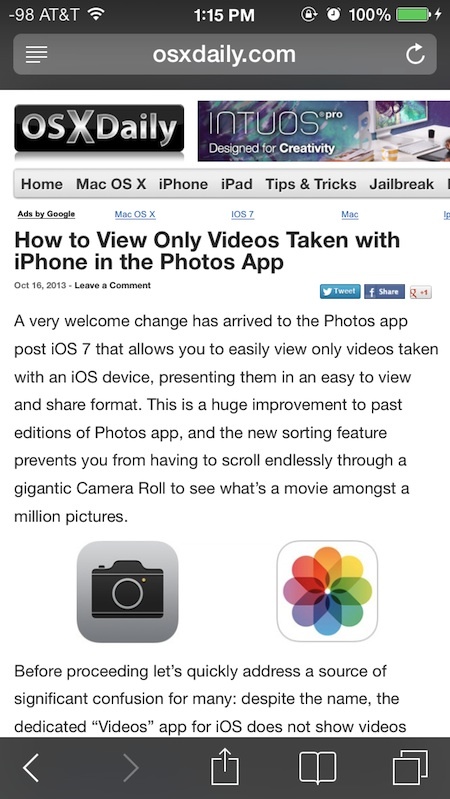 I would like to know how to convert the websites I already have open into private pages like it did in iOS 7. In iOS 9 you have to click on the double boxes in the upper right hand corner, and it only opens a completely new private window, instead of converting the pages you’re currently on to private windows. This is how you enter private mode in Safari for iOS 10 and iOS 9, that is how you do it. There is no other way. You can not convert a page to Private Mode without opening it again in a private window. On my 16GB iPod (5th gen but with no rear facing camera) there’s no option to open a private tab. Literally where the Private button should be, there’s nothing.